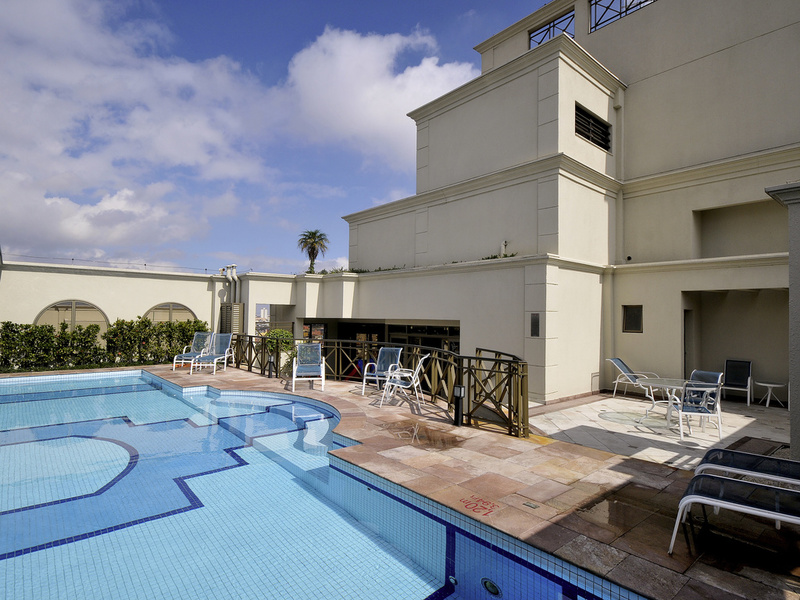 The Mercure São Caetano do Sul hotel is located in an area that is bursting with facilities. The hotel is located just a few blocks from the city's main avenue, Avenida Goiás, where multinational companies such as GM, Delphi, Siemens, Petrobras and Engefo od are located. The hotel is also noted for its famous Don Pepe di Napoli restaurant and its leisure area. Our guests, whether visiting on business or for pleasure, will enjoy our easy access to the ABC shopping centers. Offering great facilities for your stay, our apartments are equipped with a living room and kitchenette. The leisure area features a rooftop pool, games room, dry sauna and fitness center, and WIFI is available throughout the hotel With its seven events rooms, the Mercure São Caetano hotel has the ideal facilities to meet your business and leisure needs. Thanks to our 24-hour reception desk, our team is always available to offer you the best possible service! ¤ Large apartments measuring 452 sq. ft. (42 m²) with a kitchen and living room. Exclusive wedding package for you to surprise the one you love. Rooftop leisure area with a pool, sauna and fitness center. Exclusive events facilities, with seven meeting rooms. Whether you're here for a long or short stay, make the most of our comfortable apartments. With the option of no-smoking floors, our apartments are air-conditioned and have a bedroom, lounge with desk, kitchenette and terrace. Typical Italian restaurant, with national and international wine list. Air conditioned and with ambient music. Feijoada (traditional Brazilian stew) buffet every Saturday. Over all my staying was very good, the only comment that I have is about the Gym place with old equipment and some broke equipment. Great hotel and an awesome price! Shame about the cooking facilities. This is the second time I have stayed at the mercure in São caetano. It’s great value for money and I will stay time and time again. The only criticism that I have is that even though a full kitchen is provided, no actual kitchen utensils or any cooking equipment is provided. Their are plates but no actual cutlery. And even though there is coffee/tea provided, their is no kettle to boil water so it’s totally redundant. Apart from that, everything was brilliant! I can’t fault the staff at all! They are very helpful! It was not as expected. Room service did not show up both days in a row (i had to call it in at 5-6pm when i arrived). Flush broke as well. Staff could be much more friendly at all times. The quality of the Wifi Internet is terrible, not even a basic Access, also it was intermintent, and I have been in this hotel many times in the past, and is the same always with the Wifi. If I could I would go to another hotel, but is the closest to my office when I go to Brazil., hope you do something about the Internet connection and quality. The batteries in the air conditioning unit were broken. The internet was faulty. The hotel is clean, friendly staff, good location in a quiet neighbourhood. That's not the first time I stay there. The team is nice , location is great and the rooms are really good! A lesson learned with humor. We made our reservations months in advance. We requested a low floor and MAYBE a room for my in-laws who are elderly and handicapped. On arrival, we were given a room that didn't look like the photo in the advertisement. We were so very tired, that we took the room and went on our way. The next morning, I asked my spouse why the toilet was built on a platform. Our room keeper Ely explained we were in a handicapped room. We looked at the room across the way, and discovered more of what we were supposed to have-minus a kitchenette. The front desk changed our rooms. Our room keeper Ely gave us nothing but 5 star service every day. Ely was the highlight of the stay. When we went to check out after 9 days, we were refunded monies, because the front desk said we did not have the right accommodations (kitchenette missing-size of room). So all in all, caution with miscommunication and question, question, question if it doesn't look like the photo on the website or meet your expectations. Even though my spouse who is from Sao Caetano spoke in Portuguese to the front desk about the foibles, we still laugh at the whole situation of miscommunication. It all worked out. I would like to state, that the Handicapped Room is of a low grade. If this room were in the United States, I think they would receive a huge citation to make proper repairs and upgrades. Pitiful how a Handicapped person would be considered less than any other person and offered a room in poor condition. I did appreciate the overall comfort and services of the hotel but did not like its location at all. The road is busy and quite load, even early in the morning. There are some food shops and restaurants nearby but if you want to go out, prepare for a long walk crossing some hills. All the crew has received us very well, we had a good time.